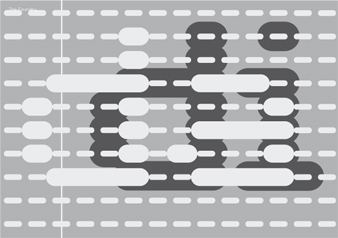 There is based on the same dot matrix system as Plek/Flek, here all the horizontal dots are joined up, it’s called, Dit /Dat, this/that in English. Dit /Dat, this/that in English. With Rick Sellars, an ex student of mine from the London College of Printing, we tested it on a front cover of the English design magazine, ‘Graphics International’. In between Christmas and New Year 2005/6 I completely remade Dit/Dat in 3 days as a sense of euphoric relief that Foundry Context had been finally released and 3 years work was over! Dit/Dat was released in October 2006.